This All Inclusive resort is surrounded by 85-acres of tropical landscape. There is a superb range of facilities to tempt you, including seven bars and a choice of nine dining options. Featuring two worlds in one, ‘Harmony’ a tranquil adult-only oasis with a spa, intimate cabana day beds, palm fringed pool with pool bar, and a brand new pool with Jacuzzi-style hot tub. ‘Splash’ hosts St Lucia’s largest water park and the superb kids&apos; club, CocoLand, with their very own water feature just for the little ones and mini zipwire. A wealth of activities for the active, including beach and pool volleyball, pool aquacise, four tennis courts (two floodlit), basketball courts, fitness centre, paintball and kite and wind surfing facility. Evening entertainment abounds, with weekly cocktail parties, theme nights and a disco in which to dance the night away. Rooms are spacious and well equipped with a sitting area and all mod cons, making them perfect for families and couples seeking a resort that really does have something for everyone. A secluded beachfront position on St Lucia’s south east Atlantic coast. Transfer time from airport: 5 minutes. Transfers included. 250 rooms on 4 floors in 2 buildings with 2 lifts in 2 wings — &apos;Harmony&apos; (adults only) and &apos;Splash&apos; (families and groups). All rooms with balcony or terrace with garden or ocean views, sitting area, air-conditioning, ceiling fan, flat-screen TV, WiFi access* (complimentary in all Concierge Room categories) mini-fridge (not stocked), clock radio, telephone, kettle, safe, iron and board, shower (no bathtubs) and hairdryer. Deluxe Garden Splash Rooms are located in the families and groups &apos;Splash&apos; wing on the ground floor, with 2 queen-size beds, sleeping maximum 4 adults or 2 adults and 2 children. All-Inclusive includes: all meals, premium and local branded alcoholic drinks and wine by the glass, unlimited juices and soft drinks. All activities and entertainment above unless otherwise stated. Deluxe Ocean Splash Rooms are on the 2nd floor of the Splash wing with partial views of the Atlantic, with 1 king-size bed with pull-out sofa or 2 queen-size beds, sleeping maximum 4 adults or 2 adults and 2 children. Premium Oceanview Splash Rooms are located on the 3rd floor with clear views of the Atlantic, with upgraded furnishings, flat-screen TV, bar area stocked with soft drinks (beer on request) and either 1 king-size bed with twin trundle bed or 2 queen-size beds, sleeping maximum 4 adults or 2 adults and 2 children. Concierge Premium Ocean Splash Rooms can be found on the 4th floor of the Splash wing, sleeping maximum 4 adults or 2 adults and 2 children. Concierge service for family reservations includes: Welcome drink and cold towel upon arrival, private check-in, private resort and kids&apos; club orientation, preferred dinner reservations, Coconut Bay ‘Family Welcome Pack’, complimentary WiFi access, daily themed treats to delivered to the room, in-room private bar (one premium bottle per guest weekly) plus mini-bar stocked daily with soft drinks, juices and bottle of wine upon arrival. Concierge service for adult-only reservations includes: Private VIP Champagne and a cold towel check-in reception, in-room private bar (one premium bottle per guest weekly) plus mini-bar stocked daily with soft drinks, juices and bottle of wine upon arrival, nightly turn-down service and rotating afternoon snack amenity, signature drink in-room upon arrival, private resort orientation, personal concierge assistance with spa treatments, preferred dinner reservations, tours and private dinners, complimentary WiFi access and an invitation to an al fresco adults-only dinner. 2-Bedroom Garden View Interconnecting Splash Room, located on the ground floor of the Splash wing with private patios, ideal for families, sleeping minimum 2 adults and 2 children or maximum 2 adults and 4 children. 2-Bedroom Ocean View Interconnecting Splash Room, located on the 2nd level of the Splash wing, ideal for families, sleeping minimum 2 adults and 2 children or maximum 2 adults and 4 children. 2-Bedroom Premium Ocean Splash Rooms can be found on the 3rd floor in the Splash wing, with 1 king-size bed and 2 queen beds, sleeping minimum 2 adults and 2 children or maximum 2 adults and 4 children. Deluxe Garden Harmony Rooms are located on the ground floor, with 2 queen-size beds, sleeping maximum 4 adults. Wheelchair accessible Deluxe Garden Harmony Rooms with roll-in shower and 1 king-size bed. Deluxe Ocean Harmony Rooms are on the 2nd floor with either 2 queen-size beds or 1 king-size bed with pull-out sofa bed, sleeping maximum 4 adults. Concierge Premium Ocean Harmony Rooms are on the 3rd floor with clear views of the Atlantic, additional fridge stocked weekly with a selection of water, soft drinks and wine, flat-screen TV, upgraded luxury furnishings, with either 1 king-size bed or 2 queen beds, sleeping maximum 4 adults. Concierge service for this room type includes: Private VIP Champagne and a cold towel check-in reception, in-room private bar (one premium bottle per guest weekly) plus mini-bar stocked daily with soft drinks, juices and bottle of wine upon arrival, nightly turn-down service and rotating afternoon snack amenity, signature drink in-room upon arrival, private resort orientation, personal concierge assistance with spa treatments, preferred dinner reservations, tours and private dinners, complimentary WiF and an invitation to an al fresco adults-only dinner. Concierge Junior Suite Harmony Rooms are located on the 4th floor with views of the ocean, pools and tropical gardens. Each suite has a marble bathroom with glass enclosure shower, upgraded vanity unit and toiletries, bathrobes and slippers. Luxury furnishings and sitting room area with loveseat, bar area with mini-bar stocked with soft drinks, water, beer and a premium liquor or wine selection of choice. Nightly turn-down service and rotating afternoon snack amenity. All with 1 king-size 4-poster bed, sleeping maximum 2 adults. Concierge service for this room type includes: Signature drink in room upon arrival, private resort orientation, assistance with spa treatments, dinner reservations, tours and private dinners, complimentary WiFi, private VIP check-in, and an invitation to a private al fresco couples dining experience. Premium Ocean View Harmony Rooms are located on the 3rd floor with views of the ocean, pool and gardens. Each room has a bar with mini-fridge stocked with water, soft drinks and local beer, bathroom with walk-in shower, 1 king-size bed or 2 queen-size beds, sleeping maximum 4 adults. Junior Suite Harmony Rooms are located on the 4th floor with views of the ocean, pool, gardens and the Maria Islands. Each rooms has a mini-fridge stocked with water, soft drinks and local beer, robes and slippers, evening turndown service, bathroom with walk-in shower, 1 king-size bed, sleeping maximum 2 adults. Kids Stay and Eat Free: 1st child (3-17 years) stays and eats free when sharing a room with two adults (selected dates apply). Honeymoon offer: honeymooners receive a cold towel check-in with sparkling wine upon arrival, in-room tropical fresh fruit display, and Harmony Romance dinner by invitation,when staying a minimum of 6 nights in a Concierge Junior Suite Ocean View or higher. Booking bonus: book by 31 Oct &apos;20 and save up to 55% off the accommodation cost for travel between 3 Jann–23 Oct &apos;20. The water park is a real hit and provides hours of fun for young and old — don’t miss the &apos;lazy river&apos;! 9 dining options (includes 4 à la carte options) and a beach grill. Calabash (à la carte Caribbean restaurant, open for dinner), Silk (à la carte Asian restaurant, open for dinner), Coconut Walk (International buffet, open for breakfast, lunch and dinner), Seaside (Italian restaurant, open for dinner), La Luna* (fine dining, reservation only, additional supplement applies), Flip Flops (beach grill, open for lunch, snacks and late night menu), Jerk Treehouse (casual dining, open for lunch and dinner), Veranda (adult-only à la carte restaurant, open for dinner) and The Greathouse* (at Serenity, available to Coconut Bay adults only, open for dinner, additional supplement applies). Harmony breakfast (at Calabash - adult-only, à la carte breakfast option for Harmony guests). 7 bars, all offering including non-alcoholic mixers, beer, wine, sodas, juices and an extensive selection of rums and premium liquors. Bars include Peter John&apos;s Lounge, Lobby Bar, Harmony Pool Bar, Sand Bar, Swim-up Pool Bar, Splash Bar and Paradise Beach Bar. There is an invitation to a weekly couples only beachfront dinner for Concierge Premium and Junior Suite Oceanview guests. Please note: reservations are required in the à la carte restaurants and a dress code does apply in Silk, Calabash and The Greathouse. Nightly entertainment, including Managers’ weekly cocktail party, Friday night Chocolate Extravaganza on the Stargazers Deck, weekly Harmony pool party, nightclub and themed nights. 2 nights per week the resort chefs showcase their skills with an outdoor buffet: one night showcases a Country & Western theme while the other celebrates the flavors of the Caribbean in a carnival-inspired atmosphere. Weekly family movie night on the lawn. 5 swimming pools including 2 adults only pools. 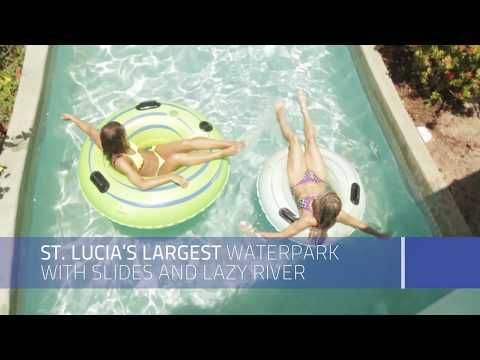 St. Lucia’s largest waterpark featuring slides, lazy river and waterfalls. Free CocoPack for kids including a backpack, t-shirt, hat and water bottle. Air-conditioned play room with napping quarters for babies and toddlers in Kidz Klub. The Caribbean’s first paintball facility, The Zone*. Daily schedule of supervised activities in CocoLand Kidz Klub provides supervised care and programmes for a range of ages, from infants through to 12 years — featuring mini-zipline, pirate ship, and water feature playground. Stunning ocean front Kai Mer Spa* with a full range of treatments*, fitness centre with gym, yoga and pilates classes along with 4 tennis courts. Beach and pool volleyball, water aerobics, 2 basketball courts and pool table. Complimentary non-motorised water sports to include snorkelling, kayaking and stand-up paddle boards. Coconut Bay Surf Shack* offering kitesurfing*, windsurfing*, certified instruction and equipment rental, where beginners and the more experienced alike can enjoy some of the best surf on the island (seasonal opening). Free CocoPack for kids including a backpack, t-shirt, hat and water bottle. 2 gift shops. Beauty salon*. Babysitting*. Nurse station* and 24-hour on-call doctor*. Complimentary WiFi access is available in the lobby area and in all Concierge Room categories only, access is chargeable in all other areas of the resort. Adventure St Lucia tour desk*. Currency exchange*. 3 nights 29 Apr-13 Dec &apos;19. 7 nights 14 Dec-02 Jan &apos;20. Please note: as the hotel sits on the Atlantic side of the island, the water can be less calm than the Caribbean side. Wading/swimming areas have been created for children. Please note: child ages are 3-17 years. We were at Coconut Bay a week ago for 10 days for our wedding.. i gotta say that the staff and wedding coordinators Onita and Melanie were amazing to help us with our big day. Also the bar staff especially Dillian for the fantastic drinks and memories. Coconut Bay is a great family getaway and we will be back soon but not soon enough. Amazing family holiday and wedding at Coconut Bay! This hotel is nice for families, it has great restaurants also the staff are very friendly. The only thing I would have liked to have seen is a better entertainment team. Also the bar on the adults side closes by 8pm.